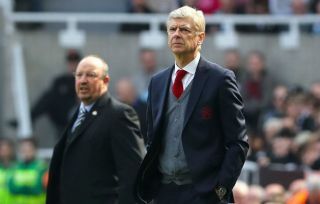 Arsenal fans are desperate for change at the club after their side let them down yet again this weekend with a 2-1 defeat away to Newcastle in the Premier League. Arsene Wenger named a bold starting line up with both Pierre-Emerick Aubameyang and Alexandre Lacazette starting together up front, and for a while it looked to be paying off. The pair combined for the opening goal as the Gunners took an early lead, but it wasn’t long before Newcastle were level and eventually went on to win the game. More poor defending from Arsenal allowed Rafael Benitez’s side back into the game and fans are now eager to see someone more solid come in to take charge of the side. In fact, some Gooners are so desperate they’re actually calling for Benitez to be that man to come in at the Emirates Stadium this summer, despite previous links with a number of more high-profile names. Could Rafael Benitez leave Newcastle to replace Arsene Wenger at Arsenal? The Magpies boss has a decent CV to fall back on, having won the Champions League and FA Cup during his time as Liverpool manager, though he’s no longer considered to be among that elite bracket of modern coaches. Given the “behind the scenes” shambles he’s had to contend with, Benitez has done a fantastic job at Newcastle. Would happily have him at The Arsenal next season. Imagine the job Benitez would do at Arsenal. Rafa Benitez would do a job as Arsenal gaffer.